Imagine a garden the size of New York City. 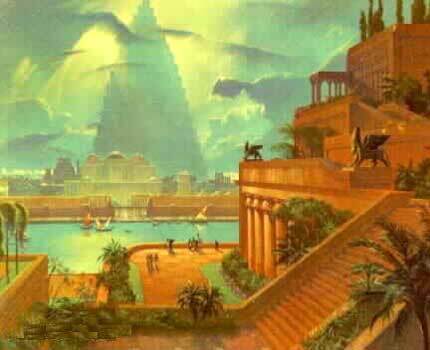 This was the Hanging Gardens of Babylon built around 600 BC. You wake up in this strange place with plants hanging from all the buildings and everywhere you look. You get overwhelmed by all the colors of the flowers mixed with the solid tan of clay brick walls. The sweet smell of blossoms fills the air. You hear a voice and turn around. There is a man that introduces himself as King Nebuchadnezzar. He is tall and has a scruffy beard hanging down his neck. He has gold bracelets under the sleeves of his bronze colored robe. He has a big smile across his face that makes you feel very welcome. After the conversation dies down, you ask him how to get home. He says there is a nearby village called Ninevah. As you walk down a path, you see a boy and his mother picking a flower from a vine. This reminds you of your parents and, suddenly, you feel homesick. Before you could take one more step, however, everything around you vanishes. You wake up in your room and realize it was all a dream. James V. Student "Hanging Gardens of Babylon - Just a Dream? by James Vanvakas" AwesomeStories.com. May 26, 2017. Apr 23, 2019.